Francis Marion University’s Children Series has exposed thousands of school-age students across the Pee Dee to art, culture, science and the humanities. Whether meeting the Wright Brothers and Martin Luther King Jr., or exploring dinosaurs and electricity through song and dance, the Children Series has never failed to delight and enlighten. 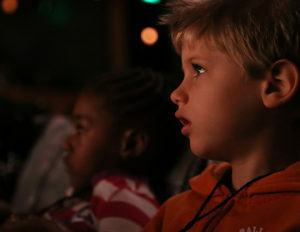 The Children’s Series presents four programs on school day mornings each school year. Classes, and indeed, sometimes entire schools, attend as groups. Dargan Street in front of the Performing Art Center is filled with school buses on show days. Many schools make a day of it, adding picnics and other event to what is always one of the best field trips of the year.